I bought two of these to go in the master bedroom. They are very well made. The drawers are even spacious enough to put clothes in, which my husband uses his for his tee shirts. The color matches the furniture I have in the room. Pair this charming nightstand with other fine wooden furniture to create a timeless sense of style in your bedroom. The nightstand features two drawers and a table top space so you can keep your glasses, books, medications, and other items close at hand in bed. Dimensions 24.0 In. X 16.75 In. X 25.0 In. It's a real bonus to receive this and NOT HAVE TO ASSEMBLE it. The only thing needed was to screw on the drawer handles. The drawers are nice and deep. It's like a mini dresser in it's capacity yet it's footprint is not over sized. As others mentioned it is a bit darker than the photo. I'm glad I read other reviews first. This will complement my new espresso bed. Be aware that the back panel is some kind of particle board, so you don't want to set this out in the middle of a living room! These nightstands actually exceeded my expectations, they came completely assembled and insanely well packed! It did take a bit to unpack them but I appreciated that overstock took such measures to ensure they arrived undamaged! They are a tad darker than my cherry furniture but it's hardly noticeable I am extremely happy with them, especially for the price. I've been looking for nightstands forever and am glad I chose these. There's tons of room in the drawers and the height is perfect for my bed. I needed a 2nd bedroom end table to compliment my other end table. This one fits the bill. It arrived very quickly. And like others..IT IS WELL WELL packed. It will take you a minute to get to the product (I did have one small tiny scratch across the top-but not enough for me to be alarmed about). But once there, I smiled at the product because it was complimentary for my bedroom furniture, and my main happiness was I did not have to put it together, just screw in the handles. Maybe the trade-off for no assembly was the time it takes to get to the item (: overall I am well pleased and would recommend this. Not cheap looking at all for the price. I have ordered from Overstock twice now and very satisfied both times. Very satisfied with this purchase, have purchased furniture online before and you always take a chance. This is by far my best online furniture purchase. I got two nightstands for the price of one! To clear up other reviews that differed. this piece in completely assembled and insanely wrapped for protection, wish I had taken a picture because it is almost comical until you have to start unwrapping it...... That is a 20 minute job, no kidding. This comes complete and nothing to do except attach the handles to the outside of the drawers. HEAVY and well made piece of furniture. My second bedroom has a couch that makes into a bed. I used two of these as end tables and it looks so elegant. I also bought on overstock: Retro Mid-Century 2-light Brushed Nickel Table Lamp. This looks so classy on top of these cherry tables. You will love them! No assembly required. I had narrowed my choices to 2 nightstands and after just assembling 2 sets of bunk beds I chose the item that came already assembled. You will have to attach the handles. This is a well made piece of furniture, especially for the price. These night stands are more cappuccino than cherry in color. But other than the color they are perfect for my guest room. The drawers hold quite a lot; the top drawer for guests clothes and the bottom for bedding. Holds it all. I am happy very happy with my choice. Well packed. Both nightstands were in excellent condition. Fully assembled. I only had to put on drawer knobs. Nightstsnds were larger than expected and fit perfectly with the bedroom set. Color was darker than in the picture but matched my bedroom set well. &#65279;The biggest job was unpacking , but very pleased with product. Nice looking with unusually deep drawers. We purchased two and, four months along, ours are holding up well. Even with setting beverages and lotions directly on it the top has simply wiped clean. The only small downside is that the drawers lack smooth glides, which I suppose could potentially be a disadvantage if one were to store heavier items. Also, as mentioned by other reviewers, the back is lighter, hence must be placed against a wall as it's unsuited for display. All okay for this modest price. I can say they other reviews reflect my experience. Packaged extremely well, all you have to do is get it out of the box and put the handles on with two phillips head screws. Color was a tiny bit darker than depicted. The drawers glide fine but I expected a higher quality due to the description/ I would say the gliding of the drawers is average. Size is as advertised/measure your space before you order it. So happy to have drawers to stash stuff. Honestly, I was looking for a couple nightstands for my teenage son. I didn't want to invest a lot of cash because most teenage boys really don't care about furniture. Oddly enough, he REALLY likes these. Clean, simple, masculine lines. Very well made (especially considering the price!). Well packaged. Almost too well packaged, if that's possible. But not a dent anywhere, and the only assembly was to screw on the draw pulls. Even a normally unmotivated teenager was willing to do that. This was truly a "slam dunk" purchase. I am surprised that this nightstand came assembled. All I have to do is screw in the draw handles. Good packing, great value, and above all no assembly! Nightstand needs little assembly; just reverse the handles on the front. Right size, right height. Looks great next to contemporary black leather bed! Nice size, color and quality! Thin wood, decent construction. Would buy again for price! Nice piece of furniture but more expresso than cherry finish, which is disappointing as trying to match other furniture. Love this side table, but scratches very easily. Night Stand looks as pictured. The color is slightly darker which worked for us. The drawers are not solid wood but fits our needs. We've had it for about 2 years already and it is still holding up very well. Beautiful set of night stands. Perfect for our bedroom. Match the color of our existing bedroom set. Great piece, I got 2 of them and am glad I did!! Arrived in perfect condition. Beautiful piece of furniture, roomy drawers. These nightstands are very very nice and just what I wanted. It appears that they are well made and all wood. They arrived in perfect condition which is no surprise considering how they were packed for delivery. I am extremely pleased. It is French dovetailed construction. "How deep are each of the drawers? Thanks." "Seems that this item is out of stock. Will you be getting more? If so, when?" "What are the dimensions of the box it comes in?" Approximately 25 inches high x 16 inches wide x 24 inches long. "Do the drawers pull all the way out?" "Are the drawers supposed to be able to come out completely? I received two of these nightstands today and the top drawer on one of the nightstands doesn't seem to be properly connected to the slide. When I pull the drawer out it leans down and I can turn it side to side and yet, I can't get it free from the dresser. Thanks in advance for your help!" Had a similar issue with one of mine and Overstock had to send me a replacement. There was no way to get the drawer out. If someone figured it out would love to know. "Will the color and finish of this night stand (Mellowi) go with the Draper 6 drawer dresser?" 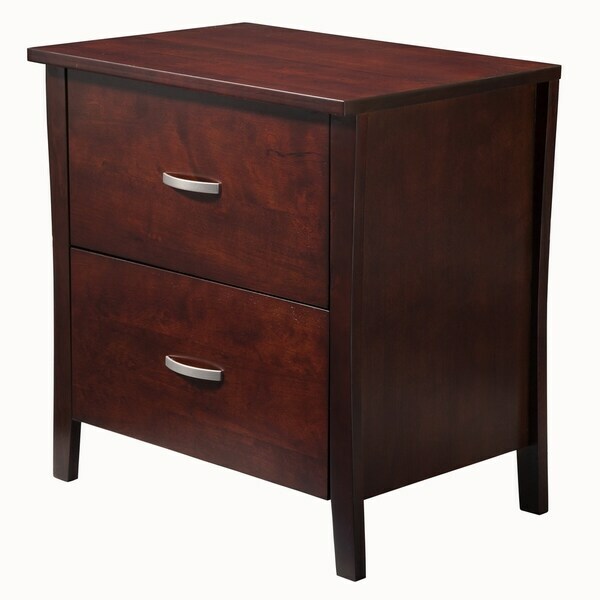 Many customers purchase item# 80004529 with this nightstand. However, the draper appears to be similar in color as well.